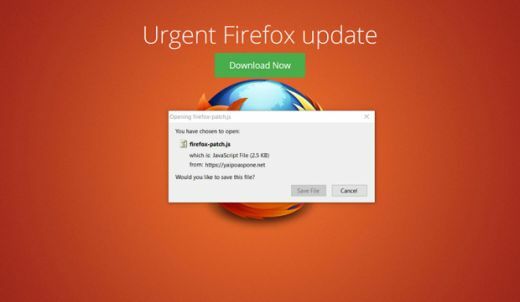 Update any software from a message like the Firefox Scam below. This scam is also run for Chrome, Flash and other software you have. Those of you with Ninite Updater, which should be everyone, use Ninite to handle updates to Chrome, Firefox, and Flash. Cliqz, Chrome, and Firefox will also update themselves. You will not be required to go somewhere to do it. You can update manually from their Help / About menu. Flash could be manually updated by going to https://get.adobe.com/flashplayer/, but you will need to be sure and uncheck all the boxes for add-on crap they try to force on you. It is better to let Ninite Updater handle it with you. Your Antivirus also should be updated from within the program itself, never from a pop-up on a website. But, you might ask, what if I see an advertisement for a nifty keen USB combination flash drive and flashlight, plus USB to Bluetooth converter and bird bath? Then open a new tab and do a search and go to a trusted online retailer and try to find such an item. One of the problems with these scams is that you cannot trust the symbols on the pop-up to do what they say. Remember, they are potentially miscreants out to get you. The Cancel button could actually mean "Download and install". Just because there is an X in the upper right, doesn't mean it will act properly and close. You are pretty safe closing the tab with the X in the tab, but you might want to just close the browser entirely. Never let any of these scammers remote into your computer. Neither Microsoft nor Intel have people watching the Internet to help you with your problems.